This Arlington front garden was shaded by an old redbud tree and overgrown shrubs that blocked the view of the house. The new design includes a tapestry of easy care but unusual shrubs and perennials that provide four-season color and texture. A new arborvitae hedge was planted to screen the neighbor's house. This charming house was originally dominated by a huge maple tree. 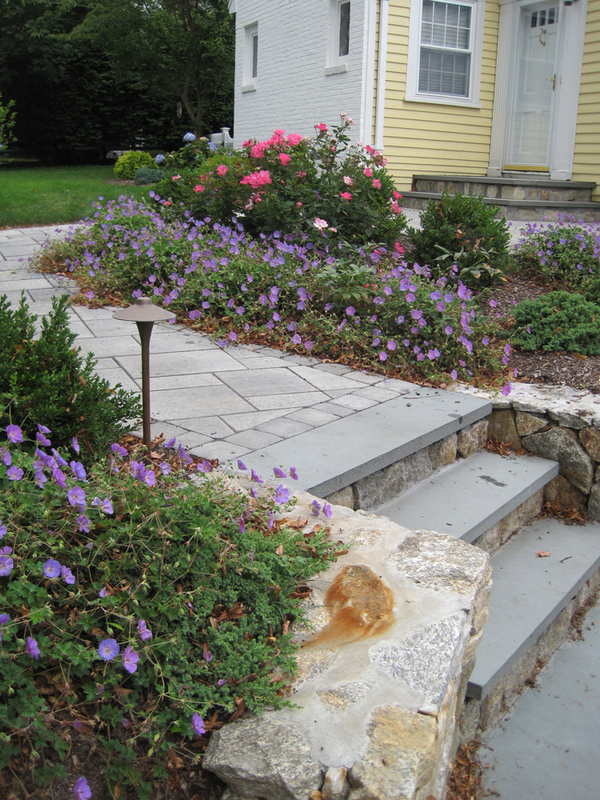 Old stone steps and crumbling retaining wall made the entryway dangerous for visitors. There were no walkways from the street or driveway. The new design opened up the front yard and created welcoming entries from the driveway and street with new bluestone steps, elegant paved walkways, small patio, and a handsome fieldstone retaining wall. The sunny cottage garden now boasts a star magnolia tree, blue hydrangeas, pink roses, boxwood and blue geraniums.